Young entrepreneurs are typically long on ideas, short on business experience and lack capital resources. Incubator fund Victory Square Technologies (CNSX:VST) is a potential answer to their prayers. Victory Square not only invests in innovative entrepreneurs, but provides them with a network of mentors, distribution partners, education programs, access to over 80 accelerators globally, and various other resources. “We believe tech has become commoditized, which makes distribution and acquisition so important,” says Victory Square chief executive officer Shafin Tejani. The Canadian company might be better known to some investors as Fantasy 6 Sports, which listed on the Canadian Securities Exchange in May 2016. In June of this year it changed its name to formally reflect the switch in business model to a venture builder that creates, funds and empowers entrepreneurs predominantly focused on blockchain technology, virtual reality, artificial intelligence, personalized health, gaming and film. “Our vision is to continue to build a profitable portfolio of technology companies by giving them access to our resources that help accelerate growth,” says Tejani. The genesis of Victory Square goes back further than 2016, however. 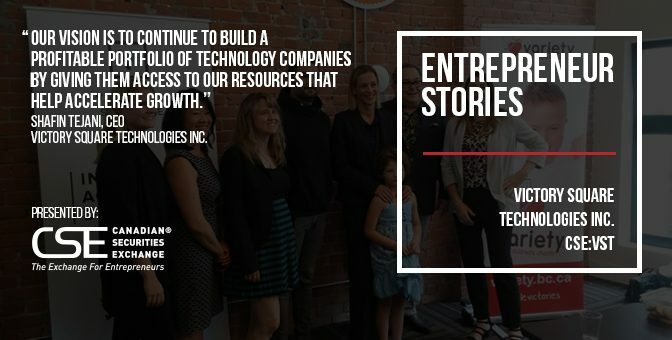 In 2007, Tejani founded Victory Square Labs, and built a successful track record funding seed-stage tech companies with exceptional entrepreneurs and high growth potential. Successes included BTL Group; Tantalus Labs; V2 Games; a Film Fund deal with Unified Pictures; and partnerships with Launch Academy, Foxwoods Casino, BC Diabetes, and others. “Given our record of successful results, we decided to create a public portfolio to scale faster. The first company the public vehicle targeted was Fantasy 6 Sports due to its high growth potential and the fact that sports and mobile gaming is global, it transcends geography, language, culture, etc.,” Tejani explains. The fantasy sports company was, if you like, the advance guard for the rest of the Victory Square army. “The entrepreneurs, IP [intellectual property], experience, talent, customers and partnerships that we established in these diverse verticals laid the solid foundation for the current and future portfolio of companies in Victory Square Technologies,” Tejani says. Key to the company’s business proposition is the management team, which has a broad range of experience that matches the company’s areas of specialization. The team includes former executives in professional sports, entertainment, video, media and film, along with leaders in technology, immersive sports, casinos, horse racing and gaming. Tejani has successfully launched more than 40 start-ups in 21 countries, employing hundreds of people and generating more than US$100 million in annual revenues. He’s been there, done it, and he’s not only bought the T-shirt but probably knows the people who designed it and the creators of the technology they used to produce it. The executive team includes seasoned entrepreneurs and FansUnite co-founders Darius Eghdami and Duncan McIntyre, a chartered accountant and lawyer respectively, who focus on corporate development and operations. Director Howard Blank has been an executive of the gaming and entertainment sector for more than 30 years, most recently serving as vice president of Media, Entertainment and Responsible Gaming for the Great Canadian Gaming Corporation. Fellow director Tom Mayenknecht’s career spans journalism, television, professional tennis, executive management leadership with both the Toronto Raptors and Vancouver Grizzlies of the National Basketball Association, and the start-up of what is now Rogers Arena. He’s probably not the guy to challenge to a game of tennis at the office party. Peter Smyrniotis, another director, is described as a “technologist”, as well as an entrepreneur and commercialization and growth professional based in Vancouver. Tejani is adding to the depth of the team as his portfolio grows and expects to announce some pedigree additions in the near term. The team also leans heavily on thought leaders at the companies it funds, both privately and through the company. The expertise these executives bring has proven invaluable in analyzing business opportunities. Since its metamorphosis into an incubator fund in June, the company has made two major moves. The first was to acquire a 40% interest in Unified Film Fund II, an entity that will be producing three major films in 2017 and 2018. Two of the three could garner worldwide distribution right receipts of around US$14.4 million given estimates projected by talent agency William Morris Endeavor Entertainment and other sources. Victory Square acquired its stake in the fund by issuing five million shares at an assumed price of $0.85, so essentially the stake cost C$4.25 million. Shortly after strengthening its presence in the film and entertainment arena, it created a new venture, Victory Square Health, to oversee companies in its portfolio working on personalized health technologies. Victory Square Health’s initial mission will be focused on management and prevention of the modern scourge that is diabetes. Victory Square Health will make some introductions and provide technical development capabilities to its chosen projects. Tejani believes personalized health is the future of medicine and that the team and partnerships Victory Square Health has established will allow it to be at the forefront of the rapidly growing health tech industry. Through strategic resources and technical development capabilities, Victory Square Health will use its relationships with seasoned industry experts, including Dr Bruce McManus and Dr Pieter Cullis, institutions such as the University of British Columbia and Simon Fraser University, and organizations such as BC Diabetes with leading endocrinologist Dr Tom Elliott. Some might expect Tejani to be carrying out this sort of activity in California’s Silicon Valley, but in fact British Columbia is awash with technology companies. “British Columbia is a great place to build a tech company,” Tejani asserts. So, there are plenty of great candidates to go under Victory Square’s microscope, and better still, they won’t be expecting California-style levels of financial backing. “We take great pride in being based out of Canada, and British Columbia specifically. Both the federal and provincial governments have made it a goal to continue to foster innovation, which can be clearly seen by the provision of integral grants and credits,” says Tejani. Victory Square’s current market capitalisation is around C$37 million and the group is focused on building businesses with positive cash flow and exponential growth potential. Which brings us to the subject of valuing Victory Square. It is the nature of incubators that they fly below the radar for long periods, investing money for little return until they cash in, perhaps through a trade sale or stock market flotation. It’s at that point that the value is crystallized; otherwise, analysts must make their best guess at the worth of the portfolio, based on values of similar companies. Having said that, the company is not plowing its cash into money pits. “We build businesses that generate positive cash flow and continue to grow,” Tejani declares. If 2017 is earmarked as the year the company scales up, then next year should be the one where it strides toward profitability, powered by revenue from its film investments and personalized health initiatives. Tejani is motivated to find liquidity events along the way that will allow companies in the portfolio to find new funding sources and grow their investor bases. Few can deny that tech, leisure and healthcare are markets with massive growth potential. In the meantime, it is just a matter of sitting tight and trusting the skills and judgement of a team that collectively has more than 100 years of award-winning entrepreneurial experience. Learn more about Victory Square Technologies at http://www.victorysquare.com/ and on the CSE website at http://thecse.com/en/listings/technology/victory-square-technologies-inc. The waves of legalized recreational marijuana in Colorado, Washington, Canada and now California have sparked a ‘Green Rush’ in the cannabis industry, but Alternate Health (CSE:AHG) CEO Dr Jamison Feramisco reminds investors not to forget about the market potential of the medical side of the business. The diversified healthcare company – which has patent rights for CBD delivery systems for sublingual tablets and transdermal patches and offers education programmes, electronic medical records (EMR) software and toxicology laboratory analysis – started trading on the Canadian Securities Exchange in January. Two months later it joined the US markets on the OTC bulletin board. Feramisco brings experience in delivering profitability, strategic mergers and acquisitions and innovation in healthcare as the co-founder and president of Texas-based Apri Health – a healthcare data analytics company, formerly known as Transfuse Solutions. Feramisco is a graduate of the University of Texas at Southwestern Medical School with a Ph.D. in Molecular Genetics and Biochemistry. Alternate Health stands to gain from the growing market of medical marijuana. There are about 40,000 patients with prescriptions for medical marijuana in Canada, according to Health Canada. Over the next 10 years, the number of these patients is expected to grow to more than 450,000. The group’s Alternate Health Media division offers education programmes for training healthcare professionals and physicians in the use of cannabis to treat medical conditions. The Cannabidiol Certification Programs have been approved by the American Medical Association (AMA) and address all facets for the use of marijuana’s two active chemicals that have medical applications – cannabinol (CBD) and tetrahydrocannabinol (THC). CBD and THC are considered useful substances to manage pain, and are also prescribed by some physicians for conditions including glaucoma, epilepsy and anxiety. In January, the company announced the first continuing medical education course for practitioners on the endocannabinoid system, the body’s reaction to CBDs. The video-based course, accredited through the University of Louisville and approved by the AMA, provides an overview of the endocannabinoid system and the role it plays in the different functions of the human body. Alternate Health has acquired the commercial rights to patents for developing and manufacturing sublingual tablets that include CBDs and/or THC. The sublingual tablets can be rapidly absorbed into the body in less than three minutes. The company said it recognised the need for a more efficient way to use medical cannabis than the traditional smoking and ingestion methods. Sentar Pharmaceuticals in March granted Alternate Health an exclusive 10-year agreement for global nutraceutical license rights to its patented sublingual delivery systems to administer CBD and THC in tablet form. The company paid Sentar 850,000 common shares for the renewable license agreement. The California marijuana Industry is estimated to grow to $25bn per year and is set to eclipse $50bn by 2026, Alternate Health said, citing USA Today. “Alternate Health is uniquely positioned for licensing their manufacturing pharmaceutical grade delivery systems of CBD and THC healing products in this fast-growing new marketplace,” says Feramisco. Alternate Health describes itself as a leader in software applications and processing systems to the medical industry. Its Alternate Health Technology business includes VIP Patient, electronic medical record (EMR) software that allows doctors to register patients and document their diagnosis and generate insurance recoveries with up-to-date billing codes. The CanaCard Patient Management System tracks patient data and prescriptions while ensuring regulatory guidelines and financial transparency. It is a complete EMR, managing controlled substances like medical marijuana with an interface between patient, doctor and licensed provider. The group also has an independent clinical lab in San Antonio, Texas, under the banner of its Alternate Health Labs business, which specialises in toxicology and blood testing services. The lab receives and assesses the blood and urine of patients from across the United States and then supplies the results to physicians so they can diagnose and treat diseases and medical conditions. In March, the company agreed a deal to expand the business through the acquisition of a 20% stake in Clover Trail Capital, a Texas-based investment company. 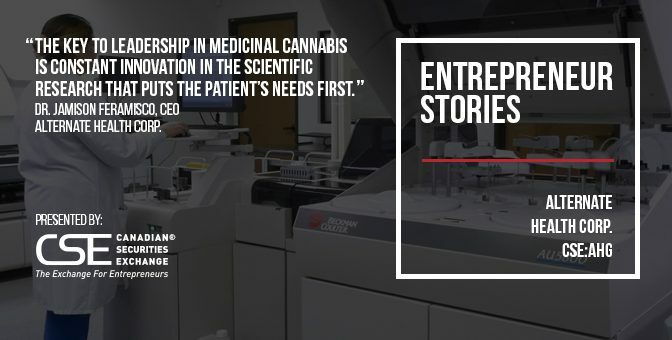 Clover Trail, which owns a 40% holding in Sun Clinical Laboratories, has investments in labs that conduct toxicology and blood studies for hospitals, private insurance groups and clinics. This story was originally published at www.proactiveinvestors.com on May 11, 2017 and featured in The CSE Quarterly. Learn more about Alternate Health at http://alternatehealth.ca/ and on the CSE website at http://thecse.com/en/listings/life-sciences/alternate-health-corp. When one thinks of Japan, sushi, Shinkansen bullet trains and onsen hot spring resorts come to mind more readily for 99.9% of the population than precious metals exploration. But those famous hot springs are plentiful because of geothermal activity, and this special geological phenomenon in Japan has given rise to some rich gold mines in years past. The most impressive example in modern times is the Hishikari mine located on the southern island of Kyushu. Operated by Sumitomo Metal Mining Co. Ltd. (Tokyo Stock Exchange:5713), Hishikari is very high-grade in nature, averaging some 40 grams per ton of gold in its ore.
Quinton Hennigh and Akiko Levinson knew about the potential for exploration in Japan as they were building up ounces at the Springpole deposit in Ontario while running Gold Canyon Resources. Springpole developed into a resource of over 5 million ounces of gold before the company was acquired by First Mining Finance in 2015. As part of the deal, Gold Canyon spun out a new company with Levinson at the helm. She and Hennigh had for years agreed that if they ever started a new company, it would focus on Japan. The new vehicle was their chance and Irving Resources (CSE:IRV) had its direction laid out from the get go. As 2017 kicks off, Irving has a project portfolio with all the hallmarks investors like to see – multiple projects with high-grade gold and silver showings, sound infrastructure, and a friendly jurisdiction to work in. Combine these attributes with good share structure and a healthy treasury and the Irving story has become an investor favourite, its stock price rising over 600% in the past 12 months to around $0.90. In November 2016, Irving raised just short of $6 million, with famed precious metals investor Eric Sprott personally providing the lead order. That leaves the company with over $7 million in the treasury, or to put it another way, all the financial runway it needs for well over a year to begin showing the world how rewarding precious metals exploration in Japan can be. Irving, though a local subsidiary, has thus far acquired three projects, all located on Japan’s northernmost island of Hokkaido. Each of the projects holds great promise from an exploration standpoint, but Omui is the one that excites Hennigh most at this early stage, and with good reason. Chip sampling off float boulders on the property returned assay numbers the company termed “exceptional”. The assays included samples of 480 grams per tonne (g/t) gold and 9,660 g/t silver, 143.5 g/t gold and 2,090 g/t silver, and others of similar quality. Even the newcomer to investing in precious metals will recognize those grades as being virtually off the charts. Importantly, the exploration team has also found Omui’s rock to contain silica, a common element accompanying veined precious metal deposits, and critical to ore processing in Japan. The early results indicate rock at Omui being very low in toxic elements such as arsenic and antimony as well, suggesting any deposit outlined at the project could yield ideal smelter feed for domestic refineries. While Hennigh and Levinson will be spending quite a bit of time in Japan going forward, when not there they have teammates to rely on in the country who are second to none. Hidetoshi Takaoka enjoyed a long career at Sumitomo Metal Mining, helping to explore the Hishikari deposit and sharing credit for finding and developing Alaska’s world class Pogo gold deposit. “I’d say Mr. Takaoka is Japan’s best known geologist,” says Hennigh. Irving also considers itself fortunate to be working with Haruo Harada and Mitsui Mineral Development Engineering Co., Ltd. (MINDECO) for assistance with permitting applications and other work with specific engineering requirements. Dr. Kuang Ine Lu, an Irving Resources director who earned a Ph. D in Economic Geology from the University of Tokyo, brings yet another experienced hand to evaluate projects and strategy based on years of local experience. Longer term, the plan at Irving is to prove up deposits from which to sell smelter feed to domestic smelters. Hennigh is quick to point out, though, that the company intends to move ahead in a methodical manner, so as to make the most of its financial resources and ensure the highest possible likelihood of ultimate success. Interestingly, Hennigh says that experienced drill teams are available in Japan not only owing to mineral exploration but also because resorts and energy projects drill to tap hot springs throughout the country. They use core drills primarily, which is exactly what Irving wants so that it can preserve layers of rock and assess veining at various depths in detail. Shareholders will be happy to learn that the depths Irving envisions its targets at are not that daunting, with Hishikari’s deepest levels of 350m serving us a good indicator for a Japanese precious metals deposit. And because of Japan’s size and advanced development, project accessibility is not an issue. “Most areas in Japan are accessible by road and we don’t have to walk more than half a kilometer to any of the sites,” says Hennigh. The stars seem aligned to make 2017 an exciting year for Hennigh, Levinson and the rest of the Irving Resources team. 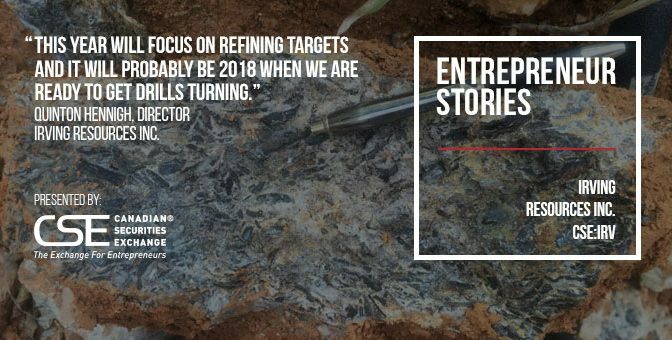 With field work starting in a few months and early project showings nothing short of outstanding, the company is set to draw attention to a country whose potential for precious metals exploration has largely been overlooked. This story was originally published at www.proactiveinvestors.com on Feb 27, 2017 and featured in The CSE Quarterly. Learn more about Irving Resources Inc. at https://www.irvresources.com/ and on the CSE website at http://thecse.com/en/listings/mining/irving-resources-inc. This story was originally published at www.proactiveinvestors.com on Sep 6, 2016 and featured in The CSE Quarterly. “I want it and I want it now.” So the pundits say is the mindset of millennials, a generation that has grown up amid instant access to information and unprecedented awareness of other peoples’ lifestyles. Businesses, for their part, have long been this way, as some processes simply cannot move forward without the availability of certain items or documents. Vancouver-based ParcelPal Technology Inc. (CSE:PKG) is counting on these dynamics, looking to provide on-demand (within 1 hour) and same-day delivery in local markets that beats the likes of Canada Post, FedEx and local carriers hands down. The prize is a portion of what the company claims is a market in which billions of dollars are spent each year getting items from one location to another. The ParcelPal platform is a user-friendly marriage of software and logistics. When a customer wants something delivered they enter the details via computer or mobile device and a courier registered with ParcelPal is alerted to the request. Much like the famed Uber system for local transportation, couriers are rated by customers, and the higher your rank the more likely you are to receive the initial alert. Once a courier accepts a delivery request, wheels are set in motion both literally and figuratively. The courier travels immediately to the pickup point and takes possession of the package. As the courier makes his way to the destination, GPS technology is used to monitor progress. No more sitting at home all afternoon waiting for something to arrive – the customers on each end of the transaction can see precisely what is happening so they can make any related decisions accordingly. The cost is reasonable, at $3.99 within a 4km radius for same-day delivery and $6.99 within that same radius for 1-hour service. Charges on top of the base rate are added for deliveries of more than 4km or for packages weighing more than 25kg. Of the fee, 80% goes to the courier and 20% to ParcelPal. ParcelPal has also implemented an insurance program whereby customers can select to insure their items for up to $1,000. The company gets 100% of the insurance revenue. Vice President of Operations Kelly Abbott explains that ParcelPal currently has some 1,600 couriers registered to deliver its packages, each of whom has undergone a screening process and training session to ensure they represent the company professionally. Also reflecting the Uber model, couriers have the opportunity to rate customers. In this way, automation introduces efficiency but accountability is maintained through detailed monitoring of operations and real-time rating of the system’s various human components. 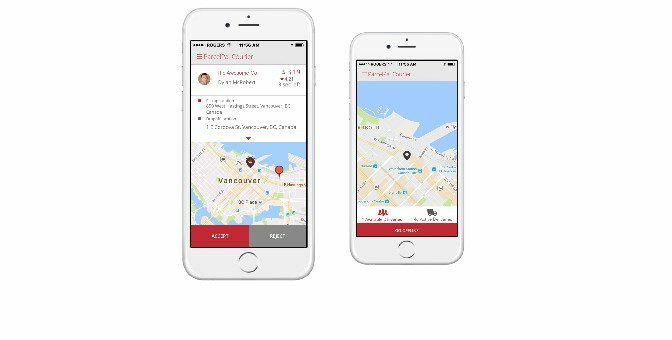 In the first quarter of this year, ParcelPal conducted a six-week beta launch during which it delivered over 200 packages in Vancouver and the surrounding area, its couriers traveling over 5,000km in total. The launch went “very well” according to Moreau. Moreau and Abbott realize that ParcelPal will have to cement its reputation before big retailers agree to feature it as a delivery option on their websites. But for smaller retailers for whom such a service could be an immediate boon to business, the API (coder lingo for the ParcelPal computer program a retailer would hook up to its system) and Shopify plug-in are available for download. Lest anyone conclude that ParcelPal can establish itself as a household name overnight, Moreau is quick to point to the growth curve experienced by Postmates, a local delivery service based in San Francisco that was established in 2011. “It took them about five months to do their first 1,000 deliveries,” explains Moreau. A graph distributed by Postmates founder Bastian Lehmann showed it taking 116 weeks to reach 500,000 deliveries, but then only another 20 weeks to reach 1 million. All things considered, ParcelPal seems off to a good start, with business in the first half of 2016 having moved forward according to schedule. The company recently ran an online advertising campaign which further convinced management that demand for speedy delivery is out there waiting to be met, particularly among consumers. Consumer scenarios are limited in number only by one’s imagination, but a busy person needing a particular article of clothing for a function or a group wanting to order food from a restaurant are ones to which ParcelPal is perfectly suited. ParcelPal is planning to launch its consumer app early in the fall.